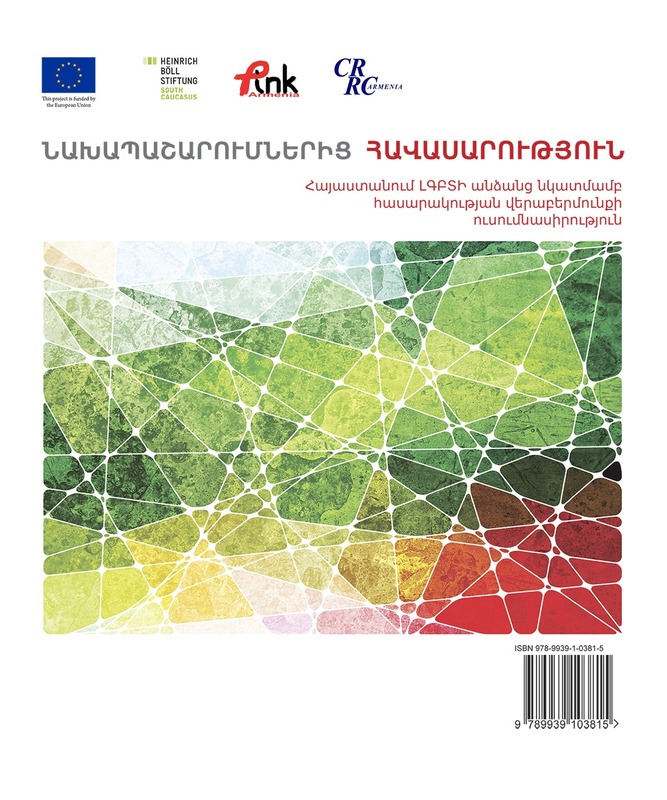 In collaboration with the Heinrich Böll Foundation’s South Caucasus office, Pink Armenia conducted a study of attitudes towards LGBTI (Lesbian, Gay, Bisexual, Transgender, Intersex) people in Armenia. “From prejudice to equality”, a survey conducted in November-December 2015 in Yerevan and all regions of Armenia, showed that 90% of Armenia’s population is against LBGTI people, agreeing that their rights should be limited through legal means. However, the survey also showed, that in case individuals have LGBTI acquaintances, they are more tolerant towards them: from among the 1017 individuals surveyed, 91% stated that they are not acquainted with any LGBTI individuals; from those who did have acquaintances, 11% claimed to have an LGBTI friend. Television is the main means of receiving information about LGBTI people. From among those surveyed, 462 receive such information from news broadcasts, while 151 claim to receive it from entertainment programs. Television is following by social networks, which is the source of information for 139 surveyed individuals, while online news sources serve as the information source for 111 of those surveyed. The least information about LGBTI persons comes from radio and print news, each serving as the information source for 13 surveyed individuals. The study showed, that a majority of people in Armenia, 33%, are convinced that homosexuality is a result of an incorrect upbringing. 20.6% claimed that scientists don’t have an exact answer yet as to what influences a person’s sexual orientation. 14,8% are convinced that homosexuality is a result of an excess in male or female hormones. 7,2% think that sexual orientation is related to genetic factors, while 11,8% think it is personal choice. 5.1% of those surveyed believe that one becomes homosexual as a result of “gay propaganda”. According to 3,2%, the rejection of religious and social morality turns one into a homosexual, while 2.2% believe homosexuality results in from being sexually abused as an adolescent. The difference in attitudes towards gays and lesbians is also visible from the level of acceptability of holding hands while in public: 93,8% think it’s unacceptable for gays to hold hands in public, whereas for lesbians this number was 90,7%. For both gays and lesbians, 97,5% find it unacceptable that they kiss in public. 94,7% of those surveyed had no issues with heterosexual couples holding hands in public, but 60,3% found it unacceptable that a man and woman kiss in public. Nevertheless, a majority of surveyed individuals, 40%, thinks that the rights of LGBTI people in Armenia are protected.